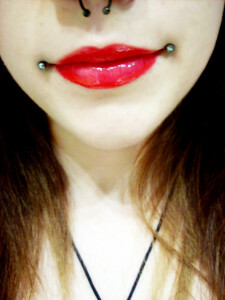 It is a type of lip piercing made on the corners of the mouth. 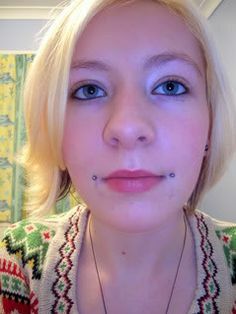 Dahlia piercing, also referred to as the Dahlia bites or Jocker piercing, is one of the less popular lip piercings due to its unusual location. It is originally inspired from the well-known scars of the comic book supervillain Joker, and is named after the infamous Black Dahlia murder case that involved similar facial mutilation. If you want to make a bold fashion statement, then go for Dahlia piercing. How is the Dahlia piercing done? Unlike other types of lip piercing, Dahlia piercing is not carried out in all piercing parlors. Some salons do not even have any information about this unique style of piercing. So you need to visit a well-trained piercing professional familiar with this piercing style. The corners of the mouth are cleaned thoroughly and marked with a pen. A sterilized, hollow needle is used to make perforations on both sides of the lips. 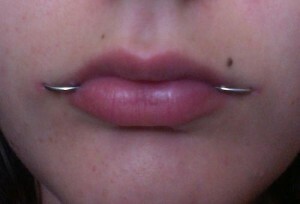 The pierced areas are then inserted with labret jewelry. Does the Dahlia piercing hurt? The level of pain varies from person to person. As two piercings are made, the process can be quite painful if you have a low capacity to bear pain. After the piercing is complete, it may hurt a lot and bleed. However, it should not be a matter of concern as the pain gradually decreases in a few weeks. It might take 12 to 20 weeks for the piercing to heal. The constant movement of the lips and cheeks causes the back plate of the labret jewelry to erode the gums and teeth. 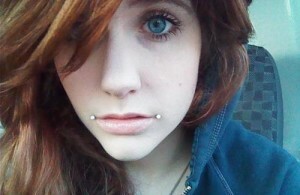 The odd location of the piercing increases the risk of rejection and migration. Irregular cleaning of the pierced region can lead to infection. Swelling, redness, itching, and pain are the signs of an infected piercing. In some cases, a scar might develop around the pierced area. However, it goes away once the healing process is complete. Labret studs made of titanium or stainless steel are used for the piercing. Captive bead rings can be worn if you feel comfortable with them. Dahlia piercing also looks great with curved barbells. Use retainers to hide the piercing at school or office. It costs around $70 in selected piercing studios.